We are in manufacturing, exporting and supplying Vibrating Fork Point Level Switch. Developed using quality components, the Vibrating Fork Point Level Switches are precisely designed by our experts. Easy to install with no calibration, we offer the best quality Vibrating Fork Point Level Switch. 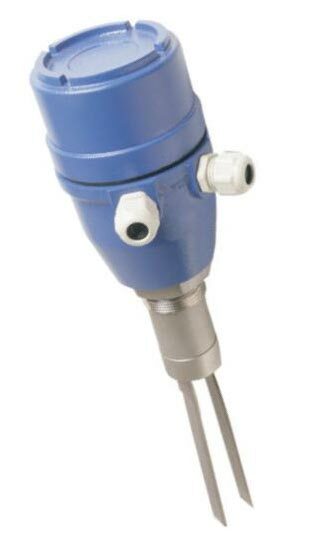 Vibratingfork Point Level Switch is suitable for fine free flowing powders and small granular material and dusty environment. No effect of electrical properties of the Service material. High Reliability. Suitable for the highly dusty environment. Field selectable operation logic. Can be configured either for High or Low Level point switching. The electronically stimulated fork vibrates at its mechanically resonance frequency of 125 Hz when the fork is free of the service material. The resonance is caused by the piezoelectric crystals. One of the piezo crystals produces a small voltage which is transmitted to the switching amplifier. If the fork is covered by the bulk material, a damping effect is produced and the piezo crystal does not produce the voltage and the amplifier will switch and a corresponding signal output is actuated. The vibration of the fork has self-cleaning properties.The light deposit on the container wal l does not af fect the operation of the JAYCEEFORK.